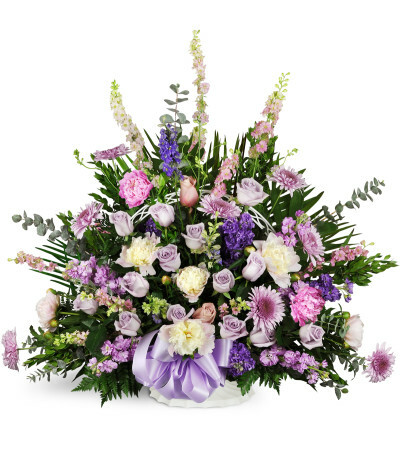 Say "I'm sorry for your loss" with this memorable sympathy gift featuring beautiful larkspur, mums, and dahlias in dusty purple, pinks and fresh whites. 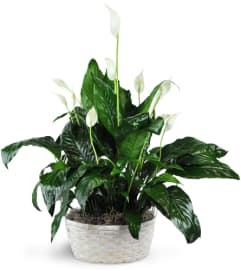 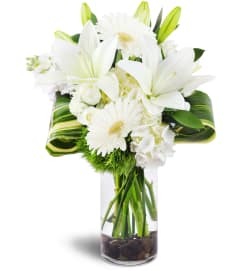 These blooms are an elegant statement of your esteem for the dearly departed. 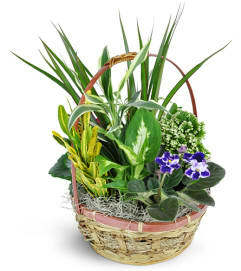 Not a typical floral sympathy basket, this thoughtful gift shows your good taste and is sure to be remembered. Larkspur, mums, and peonies in purples, pinks and whites are arranged with seasonal greenery and a satiny purple bow for accent.